At your arrival to the airport a person from the rental car will be meeting you to make the delivery of you rented car. Basic Insurance included which is mandatory; you can also apply for the full cover at the moment of the delivery. 7 Days of rental included. Afterwards you can drive to your City Hotel. A great Costa Rica vacation is waiting for you in a hot springs hotel featuring a really big natural outdoor area, which is both the largest piece of land among hotels in the zone and the very next to Arenal Volcano itself! 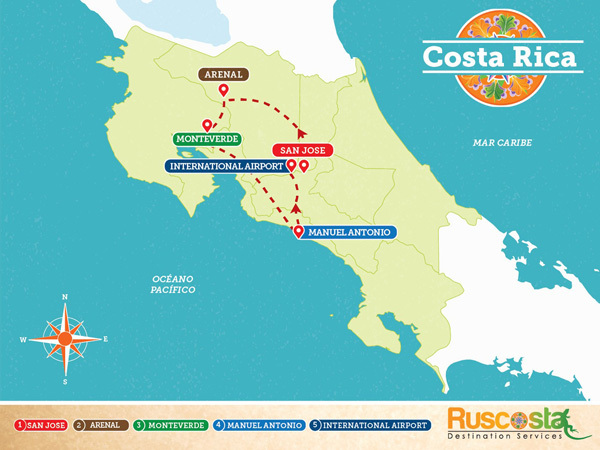 with an unique and wide range of services and facilities for the enjoyment of the volcano spectacular closest safe view, Costa Rica culture, people and cuisine, as well as the tropical rainforest flora & fauna. So be happy and let the natural hot springs by the Arenal volcano internal healthy energy & minerals complements all of your Costa Rica Vacation package activities, such that those into the nature or adventure tours. We would like to remind you that you have to be at the airport 3 hours before your flight departure. 7 Days of Rental Car mentioned in the program. Basic Insurance included. Hotel and Taxes are included.